Milky Way) is 4.3 kilometers on the soccer ball scale. One light-year is some 630 times farther, at some 2,717 km from the soccer ball. That is the distance between St. Louis and Washington DC. Still on this scale, the nearest star in our Milky Way Galaxy would be 11,433 kilometers distant, or 2,660 times more distant than Pluto. If Proxima Centauri were in Tokyo the soccer ball (Sun) would be in London! At our snail's pace of 220 mm per day, that is over 1,400 centuries away! To reach Proxima Centauri within one year we would have to travel at about 2.5 times the speed of light. The galactic center is 13,500 times more distant than the nearest star [Harwit, 1973; Kaufmann, 1993] so if we could reach Proxima Centauri in one year at 2.5 times light speed, then it would still take 13,500 years to reach the galactic center! If we were to reach the galactic center within one year we would have to fly at 33,000 times the speed of light—or, in Mr Spock's language, ''warp 5.5'' (this assumes the speed of light is warp 1.0). The nearest galaxy-like structures are the small and large Magellanic Clouds. They are almost 85,000 times farther away than the nearest star, so to reach the Magellanic Clouds in one year, we would have to fly a fantastic 212,500 times faster than the speed of light, ''warp 6.3''. The nearest spiral galaxy M-31, Andromeda, is 930,000 times farther than our nearest star, and to reach Andromeda in one year, we would have to fly a mind-bending 2,325,000 times faster than the speed of light, at ''warp speed'' 7.4. If the desire is to travel the distance in one month, a quantity of 1.07 would have to be added to the warp speed. For a one-week travel time, 1.7 would have to be added, and for one day 2.6 would have to be added. So even at the speed of light we are trapped within the area bounded by the nearest stars; see also Chapter 8. As we shall see, Einstein's concept of space-time as a four-dimensional space becomes an essential factor to comprehend and perhaps overcome this limitation. Unless we are able to harness some other form of energy (perhaps, vacuum energy) and accelerate at unheard of accelerations, we will be forever confined to the region of our solar system. In order to accelerate at these unheard of accelerations we must discover not anti-gravity but anti-inertia. Otherwise our resistance to change speed or direction will result in us being flattened to nothingness. 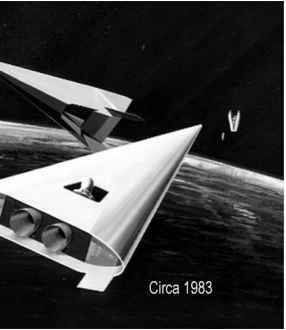 Nick Cook in Jane's Defense Weekly describes GRASP (Gravity Research for Advanced Space Propulsion) as a project with a similar goal, carried on by the partnership between The Boeing Company, "Phantom Works'' and Evgeny Podkletnov of Russia for a propellant-less propulsion system [Cook, 2001].